Alzheimer’s disease (AD) is the most common form of dementia and is a neurodegenerative disease that is most prominent in aged-individuals. Currently, the diagnosis of AD is difficult and comes with a degree of uncertainty. Its diagnosis is difficult because there is no single test that will prove beyond reasonable doubt that an individual has the disease. Similarly, its diagnosis comes with a degree of uncertainty because being the most common form of dementia, it shares many of the common symptoms (e.g. cognitive impairments, brain activity). Tests to determine cognitive function used together in conjunction with modern brain scans and identification of potential biomarkers (e.g. β amyloid and Tau[2-3]) provide physicians with information that is required to generate a reliable diagnosis of AD. The only way to conclusively diagnose AD is to perform a brain biopsy; a clinical diagnosis is done by process of elimination and will contain some degree of uncertainty as previously mentioned. leading to full onset of dementia. Dubois et al. (2007). Criteria for diagnosis of AD is based on standards set by the Diagnostic and Statistical Manual of Mental Disorders, fourth edition (DSM-IV-TR) as well as National Institute of Neurological Disorders and Stroke-Alzheimer Disease and Related Disorders (NINCDS-ADRDA). A two-step diagnostic process to identify the presence of dementia and phenotypic traits that represent AD. To meet criteria set by DSM-IV-TR, evidence of memory and cognitive impairment must be present which interferes with social function and activities of daily living. The NINCDS-ADRDA criteria has since been updated from its original criteria published in 1984. There is evidence presented in research which strongly suggests that the presence of certain biomarkers (e.g. β-amyloid) represents association with AD. Through these criteria, a patient can be evaluated based on a probabilistic diagnosis whether the issue is specifically AD, or some other form of dementia. A diagnosis of AD cannot be generated should the illness occur in sudden onset, or present symptoms which can be associated with other neurological or psychiatric disorders (e.g. hemiplegia, sensory loss, visual deficits, motor function deficits). Exclusion factors set the boundaries for diagnosis of AD. 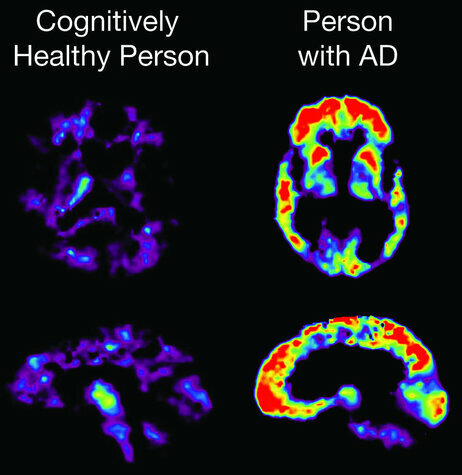 In short, a probable diagnosis of AD is only possible when there is the lack of symptoms which can be described with other disorders and the absence of non-AD dementia. This is done through satisfying the core diagnostic criteria and at least one supportive feature in the table (found below) adapted from a review on revising NINCDS-ADRDA criteria. A definite diagnosis of AD is only possible when clinical and histopathological evidence are presented, however this is not possible without examination of the brain tissue post-mortem; hence the criteria set for diagnosis of probable AD is critical for proper evaluation and diagnosis of individuals. With the identification of the proper criteria, diagnosis of dementing diseases can theoretically be more accurate and this would provide a potential area for therapy; giving physicians the potential to target the illnesses in its early stages to slow or attenuate its development. The mini-mental state examination (MMSE), also known as the Folstein test is a simple test used to evaluate cognitive function. The test is used to measure orientation to time and space, immediate recall, attention and calculation, recall, language and constructive ability. This screening process provides clinicians with a quick standardized process for determining whether cognitive impairment is present. The maximum score for the MMSE is 30, where any score between 23-30 is considered normal, 19-23 is borderline impaired and less than 19 is cognitively impaired. Each section of the MMSE has a scoring system and different scores in each section suggest a potential to be a different form of dementia. Ask the subject if you may test his/her memory. Say "ball, "flag", "tree" clearly and slowly, about one second for each. Then ask the subject to repeat them. Check the box at right for each correct response. The first repetition determines the score. If he/she does not repeat all three correctly, keep saying them up to six tries until he/she can repeat them. Ask the subject to begin with 100 and count backwards by 7. Record each response. Any response 7 or less than the previous response is a correct response. Ask the subject to spell the word, "WORLD" backwards. Record each response and order of lettering. Ask the subject to recall the three words you previously asked him/her to remember from the immediate recall category. 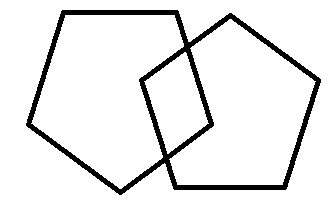 Ability to draw two intersecting pentagons - a motor evaluation. Biomarkers are used to describe the elevated or decreased presence of a measureable (quantitative) trait which represents the severity or presence of a diseased state. For Alzheimer's disease, β-amyloid and tau are two biomarkers critical for identification of the potential presence of AD. Through identification of biomarkers, potential methods for prevention of the disease can be derived as well as therapeutic approaches. 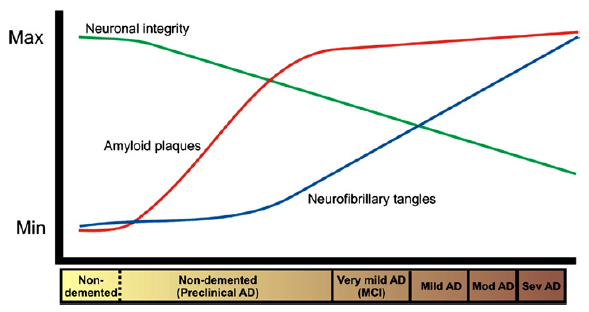 β-amyloid has been a focus of pathogenesis of AD for many years. With recent advances in science and technology, our understanding of the role that β-amyloid plays in the pathology of AD has expanded. There has been studies which evidences various activities that β-amyloid is involved in; namely amyloid deposits, solubility and overall quantity of its presence. Amyloids are formed by process of amyloidosis where proteins that are naturally found within the body are folded incorrectly and forms insoluble versions of the proteins which ultimately disrupts regular function. Amyloidosis is the cause for amyloid deposition, but it remains unclear whether its presence is directly associated to pathogenesis in certain diseases or if it is similar to the amyloid cascade hypothesis where an altered metabolism of amyloid precursor protein is the initiate for the development of AD. The formation of amyloid plaques eventually cause pathological changes such as neurofibrillary tangles (associated with the tau protein) and compromises synaptic connections leading to development of dementia[9-10]. The amyloid plaques cause a cascade of reactions by targeting attachment to neurons which sense that a foreign substance is in contact and the brain responds by sending out reagents to rid the plaques, but consequently this process destroys the neuron and its connections as well. It is known that amyloid plaques cause neurofibrillary tangles in the brain which leads to synaptic disconnections and degradation. The protein rutin which is derived from plants which can inhibit Aβ aggregation, meaning inhibition of Aβ neurotoxicity; the idea here is that therapy to reduce Aβ plaque formation to slow the progression of AD by preventing oxidative stress and neuroinflammation. It was shown that by mediating Aβ via rutin in AD transgenic mice, memory deficits were substantially lowered, extensive research and evidence associating Aβ and AD together is what makes Aβ a strong biomarker for identification of AD[1,11]. enhanced neuronal damage. Maccioni et al. (2010). Similar to β-amyloid, tau is a biomarker of AD. Tau is a microtubule-associated protein involved in neurofibrillary tangles found in AD. An important diagnostic tool that can be used to predict presence of AD is the lumbar puncture. It is evidenced that in individuals affected with AD, the level of tau proteins is elevated in their cerebrospinal fluids (CSF). By way of a lumbar puncture, which is less invasive than a brain biopsy, a physician can potentially diagnose a patient via tests examining a combination of biomarkers and behavioural traits. Neurofibrillary tangles are a common phenotype found in AD and various tauopathies; neurodegenerative diseases involving the presence of the tau protein. Its formation is caused by hyperphosphorylation of the tau protein, allowing for aggregation in an insoluble form[2,13]. Its insoluble properties once aggregated makes degradation extremely difficult, and with accumulation of these hyperphosphorylated tau proteins in the extracellular space, the brain generates a response to attack these proteins, which damages the neuron and its connections. With extensive research being done, there are many hypothesis surrounding the tau protein and Aβ; one hypothesis involves both tau and Aβ. The presence of Aβ and tau are essentially construed as damage signals and the microglia cells are activated, causing release of pro-inflammatory cytokines which are meant to attack the source that is causing the damage signals (e.g. Aβ and tau) but consequently destroy the neuron as well. 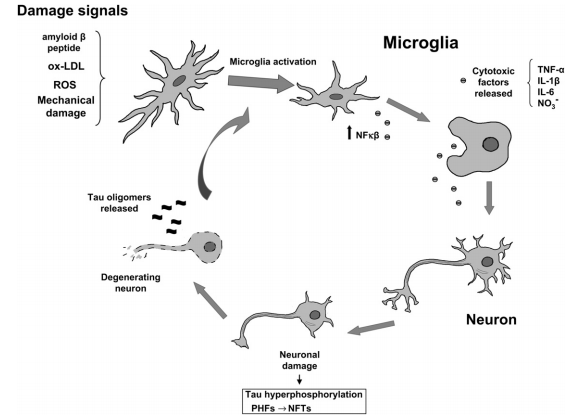 By this process, the degradation of the neurons cause release of tau proteins into the extracellular space and this further promotes microglia activation, leading to positive cycle of neuronal damage. Neuroimaging involves a variety of advanced medical technology that is able to image the structure and pharmacology of the brain. There are two categories of neuroimaging, namely structural and functional imaging. neuroimaging to detect Alzheimer's disease in the early stages. of the University of Utah. Structural imaging includes methods like computed tomography (CT) scans and magnetic resonance imaging (MRI). Due to the pathology of AD involving neurofibrillary tangles which induces neuronal loss within specific regions of the brain, resulting in atrophy, imaging techniques can be used to target these regions in patients to generate a more probable and reliable diagnosis when used in conjunction with other diagnostic tools. Atrophy is found in the early stages of AD in the medial temporal lobe. Considering affected individuals are able to catch the disease in its early stages with advances in neuroimaging, therapies that are able to slow or attenuate the progression of the disease are essential. Our ability to use structural scans and identify certain regions that are undergoing atrophy or abnormal behavior is an important diagnostic tool that makes neuroimaging a relevant and exciting area of medical technology and science. The properties of functional brain imaging are in its name; to provide images of the brain in its functional state. Functional imaging allows for direct visualization of the brain activity where the active regions are contrasted against inactive regions of the brain. Manipulation of certain pharmacological properties of compounds allows for visualization of the brain metabolism. In the case of positron emission tomography (PET) scans used for AD, a possible marker 18F-2-deoxy-2-fluoro-D-glucose (FDG) can be used to observe regional cerebral metabolism[3,15]. In a previous study it was found that in comparison to a normal functioning brain, there was decrease in metabolic activity in the temporoparietal region; as expected since the neurofibrillar tangles cause atrophy of the brain[12,14]. PET Scans are not the only form of functional imaging, there exists methods like the functional magnetic resonance (fMRI) scan, single-photon emission computed tomography (SPECT), and magnetoencephalography; all of which function to record the brain activity in real-time. The difference between structural and functional imaging is that functional imaging will expose the brain activity, it will record whether the brain is overactive or underactive; and this is important for understanding how a disease progresses and affects individuals. With structural imaging, diseases may cause atrophy or hypertrophy or produce neoplasia and these scans will identify any structural abnormalities that are present. Both types of neuroimaging are relevant and important depending on the context in which they are required. 1. Rice R.A., Berchtold N.C., Cotman C.W., Green K.N. (2014). Age-related downregulation of the CaV3.1 T-type calcium channel as a mediator of amyloid beta production. Neurobiology of Aging. 35: 1002-1011. 3. Schapiro R.C., Fagan A.M., Holtzman D.M. (2009). Biomarkers of Alzheimer’s Disease. Neurobiology of Disease. 35: 128-140. 4. Mangino M., Middlemiss C. (1997). Alzheimer’s Disease: Preventing and Recognizing a Misdiagnosis. The Nurse Practioner. 22: 58-75. 5. American Psychiatric Association. Diagnostic and statistical manual of mental disorders (IV-TR), 4th edn—text revised. Washington,DC: 2000. 6. Consensus recommendations for the postmortem diagnosis of Alzheimer’s disease. The National Institute on Aging, and Reagan Institute Working Group on Diagnostic Criteria for the Neuropathological Assessment of Alzheimer’s Disease Neuropathological Assessment of Alzheimer’s Disease. Neurobiol Aging 1997; 18: S1–S2. 7. Folstein M.F., Folstein S.E., McHugh P.R. (1975). "Mini-mental state". A practical method for grading the cognitive state of patients for the clinician. Journal of Psychiatric Research. 12: 189-198. 8. Palmqvist S., Hansson O., Minthon L., Londos E. (2009). Practical suggestions on how to differentiate dementia with Lewy bodies from Alzheimer’s disease with common cognitive tests. International Journal of Ggeriatric Psychiatry. 24: 1405-1412. 9. Murphy M.P., LeVine III H. (2010). Alzheimer’s Disease and the β-amyloid Peptide. Journal of Alzheimer’s Disease. 19: 311-323. 10. Rambaran R.N., Serpell L.C. (2008). Amyloid fibrils: abnormal protein assembly. Prion. 2: 112-117. 11. Xu P., Wang S., Yu X., Su Y., Wang T., Zhou W., Zhang H., Wang Y., Liu R. (2014). Rutin improves spatial memory in Alzheimer’s disease transgenic mice by reducing Aβ oligomer level and attenuating oxidative stress and neuroinflammation. Behavioural Brain Research. 264: 173-180. 12. Baumann T.P., Duyar H., Sollberger M., Kuhle J., Regeniter A., Mancilla B., Schmidtke K., Monsch A.U. (2010). CSF-Tau and CSF-Aβ1–42 in Posterior Cortical Atrophy. Dementia and Geriatric Cognitive Disorders. 29: 530-533. 13. Maccioni R.B., Farias G., Morales I., Navarrete L. (2010). The Revitalized Tau Hypothesis on Alzheimer’s Disease. 41: 226-231. 14. Chan D., Fox N.C., Scahill R.I., Crum W.R., Whitwell J.L., Leschziner G., Rossor A.M., Stevens J.M., Cipolotti L., Rossor M.N. (2001). Patterns of Temporal Lobe Atrophy in Semantic Dementia and Alzheimer’s Disease. Annals of Neurology. 49: 433-442. 15. Hoffman J.M., Bohmer K.A., Hanson M., Crain B., Hulette C., Earl N., Coleman R.E. (2000). FDG PET Imaging in Patients with Pathologically Verified Dementia. Journal of Nuclear Medicine. 41: 1920-1928. Great neurowiki Ivan! It was well organized and quite comprehensive. I also really liked the interactive link you had for the MMSE! I really like the layout of your page! I especially enjoyed the Folstein test and the animated/interactive sagittal scan. You've covered a lot of material in a very clear and organized manner. Great job! Gj Ivan! Nifty little Folstein test tabs! Good job with your diagrams and pictures. And that the link to the test was a good idea. Great job with the explanations and figures. The tabs for the Folstein test really adds an interactive dimension and the animated saggital scan is a nice touch. Excellent flow of information. Nice use of pictures with captions; both videos were very interesting. Enjoyed the interactive MMSE and sagittal scan. Loved your neurowiki!! Pictures/videos were extremely effective, very well researched, and extremely informative in a manner easy to understand. I learned a lot!! Loved this neurowiki. It was visually helpful and the texts were informative and easy to follow and understand. I really liked the test and how interactive it was.